A member of a four-man robbery gang, Nnamdi Onu, passed out when he was hit with the charm he prepared for victims. His gang specialised in attacking commuters at Anthony Bus Stop in Lagos State, disposing them of cash and valuables. He was arrested, Friday, following a foiled operation. Onu and members of his gang stormed the bus stop at about 5.45a.m., where they robbed passengers waiting to board buses to their respective destinations. Eyewitnesses said at about 7a.m., they snatched a bag from a lady and were fleeing the scene, when Onu was apprehended by a mob. He was said to have brought out a red amulet from his pocket and threatened to hit whoever got close to him with it. The mob retreated out of fear, thereby making way for two other members of the gang to escape. Unfortunately for Onu, he was apprehended by a team of policemen on patrol. He was said to have slumped when one of the policemen hit him with the charm. 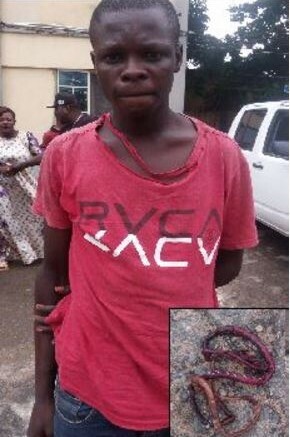 Speaking with Vanguard while being paraded alongside other suspects at the command, the Junior Secondary School 2 drop-out said: “I was lured into morning raid by my friend, Wasiu. “I used to be a private guard at a site in Ogun State. The charm was meant for protection, in case of any attack by intruders. If used on anyone, the person will faint but won’t die. “There are some that can cause an opponent to run mad, but I decided to use this because I did not want anybody’s blood to be on my head. “Wasiu only invited me to come to Anthony Bus Stop, but he did not tell me he was going for an operation. When I saw them snatching bags from female victims in particular, I could not turn back because I was afraid he could harm me. The suspect, according to the Commissioner of Police, would be charged to court soon, adding that he was among 43 suspects arrested in the state in one month.